That evening, I met Doug in the pavillon. For a while no one else came, rather unusual given that the evening sessions are often the most well attended. Pema Pera: Good seeing you again here! doug Sosa: do you read francois jullien? doug Sosa: interesting books on not doing..
doug Sosa: but just a book. Pema Pera: very rich topic, yes. doug Sosa: what is short history of this place? Pema Pera: you mean the new pavilion we are in now? doug Sosa: amazing. will i ever take the time to do that? doug Sosa: no, circumstances will decide for me..
doug Sosa: i just need to be ready to lean into it, and lean away from it. doug Sosa: well, if circumstanes speak to a deaf ear, nothing. readiness is all. Pema Pera: yet we do sometimes feel that we are placed for a choice . . .
doug Sosa: no need to tell me but what are alll the other buildings? Is it ok to explore sometime? First I thought that the first part of Doug’s last sentence was a reply to me, in a somewhat uncharacteristic way, but then I understood that it refered to what he then wrote in the next part of the sentence, given that his next line below would be the real reply. Texting can be confusing sometimes :-). doug Sosa: “placed for a choice”? wonderfully ambiguous. are we the subject or object of that sentence? doug Sosa: the water moving to your left and behind is somewhat like the fire. one wonders where it comes from, where it is going. Pema Pera: that, too, can be explored! doug Sosa: no, not now. i’ll stay till dinner calls in a shot while. doug Sosa: ah, that would be fun to follow. doug Sosa: Since I live on the edge of a river, with alsmot the same bird sounds as here..
Sigmund Schwarz: Hi, Pema, … Doug. 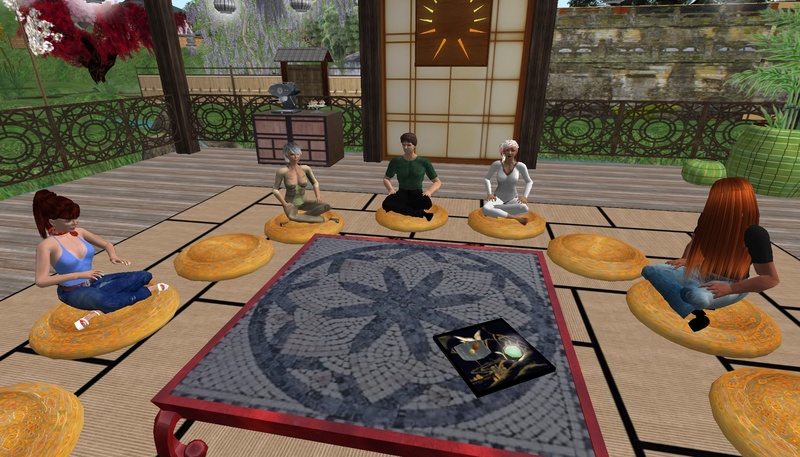 Dakini and Sigmund joined us. Pema Pera: also the only one building us place to gather in regularly, so far! doug Sosa: still bowing, i can’t dont dare look. doug Sosa: I just heard a bell..
doug Sosa: i put it on my computer, lovely, but lost it when i , well, another computer story. Back to rivers and fires. Dakini Rhode: so what were you talking about when we arrived? doug Sosa: I would rather a hut by a river than a penthouse on Central park. doug Sosa: we heat with wood, vegetables from the garden, and once a week i go to stanford to see the rest of the (affluent) world. Dakini remembers a very serious fire . . .
doug Sosa: but this is beautiful too and sometimes in my mind the two environments are on a par with each other, bit delightful. Pema Pera: what happened, Dakini? Pema Pera: did you lose a lot of irreplaceable stuff? doug Sosa: fires have such appetites. doug Sosa: I am so sorry. doug Sosa: did having stuff on the net make it any easier?
. . . and the oil spill that Isen witnessed. Dakini Rhode: wow am i a wet blanket or what? doug Sosa: At one point my mother had to put lots of stuff in storage, and the wharehouse burned down. Pema Pera: impermanence says it all . . . .
Pema Pera: haha, Dakini, yes! Genesis walked in, and Doug had to leave. doug Sosa: I must apologize for my first life dinner is ready! Bye. Sigmund Schwarz: go well and eat well. Dakini Rhode: Gen, you look like a princess! genesis Zhangsun: You look like a Bond girl! Dakini Rhode: you made me laugh! genesis Zhangsun: so nice to be here! Pema Pera: yes, it’s great seeing you here again! Dakini Rhode: nice you showed up! Dakini Rhode: Genesis, have you met Sigmund? genesis Zhangsun: why no I haven’t! Dakini Rhode: well, please meet! The talk switches to the PaB explorations. Pema Pera: Sigmund, have you had a chance to explore the 9-sec practice a bit? Sigmund Schwarz: I’ve been mindful of it at times today dispite being busy and have sat with a long breath and expanded awareness from time to time today. Pema Pera: Have you tried to write down a few words, sometimes? Sigmund Schwarz: No, haven’t kept track. Sigmund Schwarz: I understand it tracks patterns we might not be aware of. And here is where the title for this session originated. Sigmund Schwarz: I have a second home at the in between states. Pema Pera: can you say more about that? Sounds fascinating! Sigmund Schwarz: some of it has to do with language. Using words that speak to what’s apparently happening and also with how they may resonate below the surface. Sigmund Schwarz: I mine a lot of information that way plus it leads to a healthy sense of play,. Pema Pera: can you say a bit more about how you do that? Or how we could explore that? Sigmund Schwarz: Sure. 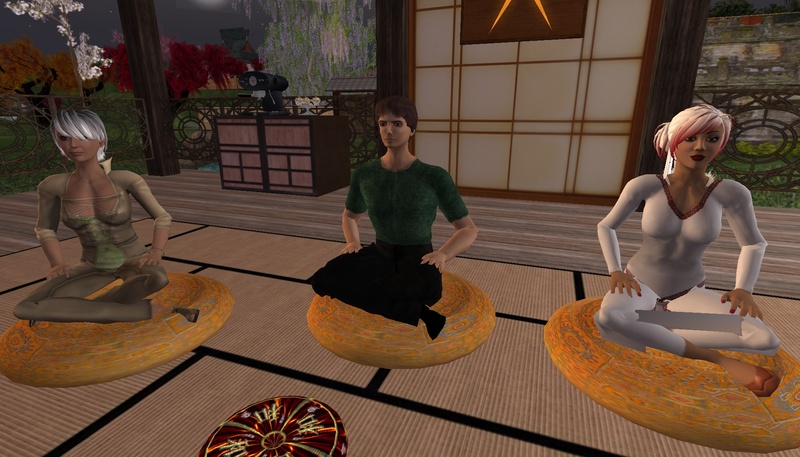 This evening when I first came to the sitting, our friend Dakini was hovering slightly over the grounds to which I responded something about hanging around, making light of things, hanging in there …. I don’t remember precisely. Sigmund Schwarz: So, I addressed what was happening in the physical, plus exploring other states of being using language and we connected in an upbeat moment. Sigmund Schwarz: I find that using language that way or combining extensions of language can turn up interesting insights, some superficial, some deeper. Sigmund Schwarz: extensions - dovetailing off of something I or someone else has said. Sigmund Schwarz: essentially in play though not always. Dakini Rhode: or would you say extracting some sort of essence from your observation? Sigmund Schwarz: That’s one of the deeper pay offs. Sigmund Schwarz: chuckling. marble cake. Sigmund Schwarz: eating it up. Sigmund Schwarz: plenty for everyone. At this point Kat joined us. It is so nice to just sit there in the pavilion, without any idea what to expect, and to just see new and old friends dropping by! Pema Pera: Long time no see here! Kat Lemieux: Needed more space? genesis Zhangsun: Kat are you engaged in the 9 second practice? Dakini Rhode: Kat, you’re from the astro world, aren’t you? Kat Lemieux: It’s true, but I’d rather be ignorant than stupid. Ignorant I can get over. Dakini Rhode: I’m trying to recall where we met - was it on mars? Actually, we did go to Mars, subsequently, as a little group, to explore. Read on! Sigmund Schwarz: neat, thank you, Kat. Though Kat had visited a few times to chat, I realized we probably never told her what it is that we’re actually doing here :>). Kat Lemieux: So what do you do in this 9 seconds? Dakini refered back to the previous session. Pema Pera: looking forward to reading it! Dakini Rhode: Pema, how do you get to the older ones? Kat Lemieux: Maybe the archive calendar? 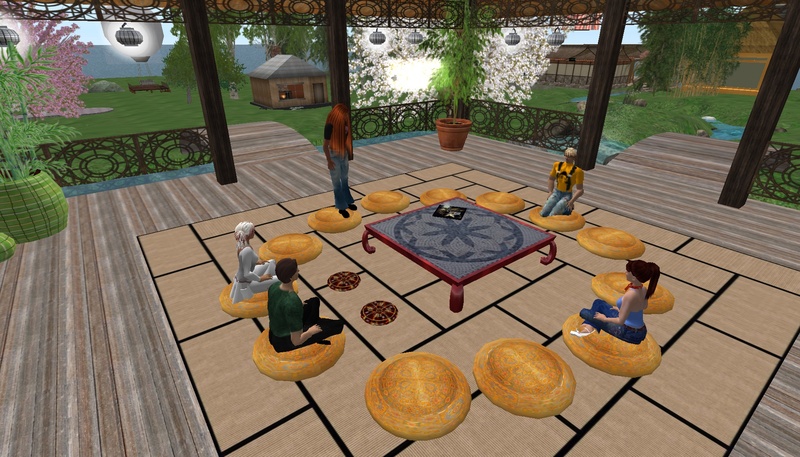 Pema Pera: for one thing, the wiki will have more than 20 authors, our whole core group, where the blog is just me . . . .
Steve dropped by. First he seemed to be seated in mid-air leaning backwards. Pema Pera: you’re training for a space flight, Steve? Then he attempted to sit at the same cushion as Kat. They looked like Siamese twins for a while. Pema Pera: a gemini flight? Finally Steve decides to sit at the opposite side of the circle from where we all are seated. stevenaia Michinaga: so, perhaps you can recap…. Sigmund Schwarz: yes, the night is getting longer. Dakini Rhode: are you on the East coast too, Sig? Sigmund Schwarz: Yes, Dakini. Just south of Pittsburgh, closer to the West Virginia and Ohio borders. Sigmund Schwarz: Neat, I have family in Philly. We talk a bit about MICA. Sigmund Schwarz: Good seeing you again, Dee. I look forward to more of the same. Pema Pera: thanks for dropping by, Kat, and everyone!